To the SENCO, a SEND governor can provide supportive accountability and critical friendship. Here are some ways to make this relationship count. Last week I emphasised that the start of the new term is the perfect time for SENCOs to plan strategically for effective SEND provision. But a SENCO is most capable of improving outcomes for young people when they can work positively and collaboratively with colleagues. One such relationship that is fundamental to a whole-school approach to SEND, but not often examined or discussed in detail, is that of the SENCO and 'link' governor for SEND. In this post I want to explain why strong governance is so important, and offer some tips for strengthening your own SENCO-governor working relationships. This will draw on the two decades' experience i have as a governor (currently co-opted to my schools' board), as well as some of the excellent free tools and resources I've highlighted throughout that will help you improve and develop this vital working partnership. In the last couple of years I've received many invitations to speak on the topic of governance and SEND at governor-focussed events, which signals a refreshing change in how we understand the modern governor's role in a whole-school approach to SEND. Unfortunately, at this sort of event (and on social media) I too often hear governance being defined as simply 'holding people [school leaders] to account'. It's a language of compliance and dogmatic oversight. which is sometimes poorly suited to our priorities (not least for SEND). Every governing body does have a responsibility to make sure that school leaders are providing the best for pupils with SEND, but this, in my view, should be part of a collaborative approach: a model for supportive accountability. In a previous post I made the case for a new model of SENCO supervision, to replace the outdated model of line management and compliance that can erect obstacles in the pathway to improving provision. This is something we have worked towards over the last few years, and I am pleased to say that our approach to governance has become much more transparent and collaborative as a result. But where did we start? And what can you do, as SENCO or SEND governor, to realign your working relationship so that it enriches your strategic leadership of SEND? Regular readers of this blog will know that I'm not a big fan of off-the-shelf tools and materials. I think that there has to be an element of personalisation if something is to work for all schools, not just a few. However, I do think we all need starting points, something to work from and am not naïve enough to realise that many schools are facing more challenges than others, therefore may need to use a tool as an important starting point. To this end I can recommend as an excellent starting point the SEND Governance Review Guide produced by the Driver Youth Trust. The guide was developed to give governing boards a way of effectively reviewing SEND provision and to build on previous work on strategic governance by the DfE and NCTL. I like the fact that this guide explicitly mentions that ‘an effective review of SEND governance should not become a simplistic box-ticking exercise’. This is paramount: our priority should be to abandon a fixed compliance model in favour of one that facilitates discussion, reflection and an unwavering commitment to improving pupils’ outcomes. This is exactly the principle that should underpin a school’s approach to governance, as well as necessitate a strong and trusting relationship between SENCO and SEND governor. I’m glad that the guide exists to help governors deliver on this promise. Download the guide to see for yourself. provide critical friendship and support. No SENCO should have to work in isolation, especially if they are not a member of the school’s SLT. So the first thing to do is find out who your link governor for SEND is, and arrange a meeting. Every governing body should include a named governor for SEND, so find them if you haven’t already! Be clear on what the SENCO and SEND governor are responsible for, and how you can work in tandem rather than overlap. The SENCO should make the day-to-day decisions while the governor is responsible for providing a strategic overview, although depending upon the professional experience of the governor – they may have been a headteacher or SENCO previously – these specific responsibilities can be negotiated. organise pupil focus groups, such as a School Support cohort and feedback to SLT. To me, as SENCO, the most valuable function of our SEND governor is as a ‘critical friend’. They provide opportunities for me to vent frustration, seek a second opinion on complex issues and much else besides. It’s particularly beneficial that our governor is a retired primary headteacher, as knowing what makes schools tick can make a massive difference. Equally, there are a number of things a SENCO can do to support their governor. First and foremost, make sure they have a robust understanding of the law. In an earlier post I stress just how essential it is for governors to know what the school’s legal obligations are, and how to meet them. In light of the recent discussion on exclusions, one could argue that this has never been more urgent, particularly with regard to SEND pupils and unlawful practices. Just as the SENCO functions best when liaising closely with young people, teachers, parents and carers, it’s also useful if your SEND governor has the opportunity to speak to these key stakeholders and get a sense of what improvements could be made and areas of challenge. Every conversation I’ve had has been empowering, and seeing things from a different perspective will be as advantageous for governors as for anyone else. You can do this in conjunction with my three-stage school improvement plan for clearer evidence of aims and impact. I am acutely aware that every school will have its own challenges; each SENCO and SEND governor working in different circumstances. So I don’t suggest that this is (or there even exists) a ‘one-size-fits-all’ approach to governance. But with limited time, and in view of the fact that modern governance isn’t about day-to-day tasks and decision-making, there’s simply no substitute for good strategic planning. So before the term runs away from you why not arrange that first meeting and start thinking, together, about your priorities for the year? How can your SEND governor help make a positive impact on pupils’ outcomes? Whatever you do, be sure to share your thoughts and experiences with us so that we may all learn and improve. Today I met with my link governor. After the customary catch up about the summer break, we discussed current challenges with funding and staffing, looked at how the new intake have settled in, arranged time to speak with our new members of staff, and pinpointed the key strategic areas that are our focus for development planning. A busy hour, but as ever, one that left me feeling really enthusiastic about the year to come. 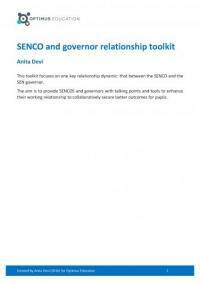 Created by Anita Devi, this toolkit of resources focuses on one fundamental relationship: that between the SENCO and the SEN governor. Improve outcomes for pupils with SEND with these strategies for better collaboration.